A few years ago a colony of honeybees came to live in our house. I was working just outside our garage when their celebration began. I suddenly was aware of three large bees hovering menacingly 2 feet away just above my sightline. I realized by the size these were soldiers, and since they were looking me straight in the 3rd eye I made a beeline for the house. Sure enough, within a minute the swarm arrived and surrounded the northwest end of our home. We all stood in Ilona's room and watched the intensity outside. There appeared to be hundreds of thousands of bees, and the noise and the numbers were terrifying. It made you sorry you've seen too many science fiction flicks. We phoned the County to find out what to do, and they referred me surprisingly to a friend of mine who they said knew everything about bees. So I called up Lars. He wanted to know when it began, but said he realized it already was too late for him to drive out to our place to see it. And sure enough, things were subsiding a bit outside. The queen was inside wherever they had chosen, and now the work of the hive would begin. Of course we were interested in what's involved in getting them out and away. Lars was philosophical about it though. This was a year after a summer in which no one even had seen a honeybee in these parts. In fact some entomologists were concerned a mite that was attacking them would render them extinct. He suggested we leave them alone. Lars said that no one knows everything about how bees move their hive, but we do know the preparation probably had been going on for days or weeks. Usually bees do it because their numbers are too big for where they are, but there may be other reasons. He said when the message goes out from the queen, scouts hunt in all directions for the right spot within a few miles diameter. That corner of our house had been selected and then watched and explored for a long time. No one knows, he says, how they actually get the queen there or whether a new one is created...but the hubbub outside had been it. I imagined a barge of flying bees carrying the queen into her new nest, but had to admit I didn't see anything like that---just this immense swarm. He said these honeybees had not chosen a spot where human contact would be possible easily. Why would they do that? They want darkness and privacy. He said they're probably in the siding or part of the house I'd have a heck of a time getting to. Most people who choose to have bees removed end up having a wall ripped out. With extreme caution I went downstairs with a lantern and verified that contact between their colony and mine would be most infrequent. But what about honey seeping through the walls or ceiling? Lars said bees make only enough for what they need. Stories about leaking honey come from folks who probably have sprayed the hive and killed them off, or from some catastrophe that has wiped them out. Bees just don't leave without using up what they've made. Sure enough, for the next few years everything Lars told me turned out to be true. We got out a stethoscope and listened through Ilona's wall to the sound of the hive and to locate where most of the action seemed to be. They were so close to Ilona's headboard where she slept that she may have studied bee language in her dreams. In the spring of the first few couple of years, some would lose their way and get in the house. We had to discourage that through squishing them. My early morning computing in the dark often was startled by a honeybee staggering onto the screen and keyboard. Eventually though they kept more to themselves and we enjoyed the benefit of a magnificently pollinated meadow and woodland. We saw not a drop of honey. Until now. Any warm day even in March, honeybees will start activity. There are no flowers but they find stuff that needs doing apparently...and maybe moisture or nourishment somewhere. March and April came and went and very few bees were flying out of their openings. I began telling the family I thought they had moved. We hadn't seen any swarming the previous summer but neither had I heard lately of mite problems wiping out hives. I thought our hive was strong. But something had happened. About the same time drops of honey began to appear on a windowsill here in the computer room below Ilona's bedroom. I put half a dozen containers to collect it, and the dripping has continued all summer. I've tasted its deliciousness, but we don't eat it as we're not sure what insulation or other materials make up this house. The few remaining bees I saw this spring have disappeared. Replacing the bees blundering into the house has come a torrent of smallish moths. At first I suggested to my complaining ladies they must be hatching from wood left over from last winter for our stoves. But the infestation has gone on and on, and clearly the larvae for these things are feeding on something and replenishing. 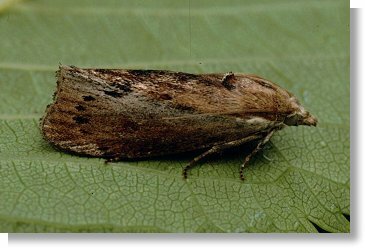 I don't get upset about any moth except a clothesmoth, whose caterpillar feeds on woolens, or those horrible grainmoths that can eat just about anything that is natural and you buy in bulk. At first I let Dana and Ilona chase them around and smash and squoosh them. I noticed they made a particularly gooey squoosh, which didn't look like they'd been feeding on wood in the larval stage. Not only were they messy and not particularly attractive, they also were sneaky. When you brushed one, they'd scurry and scuttle into hiding rather than just lift off. They move like cockroaches...which of course makes you dislike them. I concluded they were involved with the honey. But whoever heard of a caterpillar that eats honey? Caterpillars eat plants that make flowers, and butterflies and some moths feed on flowers. Why not cut to the chase and just go after honey? But what moth in its right mind would venture into a living beehive? Or do these things have to find only freshly perished hives? Lars I guess has moved away, so yesterday I talked with the honey man at the Farmer's Market. Oh yes, he said, there is the wax moth. They can kill off a hive in fact, if it's been weakened. They find a hive opening that's not tended, sneak inside and hide. They have to be fast and secretive because the bees will kill them instantly. Once the eggs are laid, the larvae eat wax, honey, and the brood itself. Beekeepers often find out they're in a hive because the bees carry out the caterpillars or the pupae that they find and drop them on the ground. (Many say the sauteed caterpillars are delicious full of honey as they are. Dunno yet.) If the hive is dead, eventually of course the honey and the moths will be gone. And so we wait...and startled, squoosh the moths that are indoors. We check our beeswax candles. I suppose when the cold of autumn comes the crisis in our wall will be over. Maybe briefly next spring something will start up again...but just the remnants. No bees. I'm sorry to lose them, because I worry when pollinators can't make it. Our blackberries this year were a sad affair compared to others we see around the county. I suspect the lack of honeybees in this particular territory played a part, because there was plenty of rain until now. I suppose if we tore off some siding and found a bee in there, we could learn if mites or moths finished them off...or if they managed to get away without our seeing them go. There may be some damage to the wall from the war that has waged in there, and so we may do that. Well, good ol' Nature and her ways: while grieving my bees, once again I learn There's Something That'll Eat Anything! so soon tresor? My, my...we raise bees you know. Our blackberries are now all put up into Jam yet I still find really nice ones to eat whilst out walk/running the hinterland paths which fork, willy nilly, hither, thither, and yon round about these wilds I call home. Malthus anyone? Not a bit: in fact Moveon.org parties this evening across the nation. Three here in Athens alone! Are you going to one Vax? "OutFoxed" will be shown on the Internet and then an interact with Al Franken. Should be fun. Maybe I'll write about it over at that other thread. You sure those berries aren't black razz---or has somebody been hard at work this week? Raise bees? Ever run into these pesky moths? Who's the "we" you mention? we had those moths dropping out of the attic through my granddaughters bedroom. The screech little girls can make over such small things is not to be under estimated. We heard of putting moth balls where the live, sure enough they decided to leave after a few days. The moths not the girls! the 'we' are my confederates in this project. Yes raising bees is one of the things we do here. Also I am sure the Blackberries are not Black Razzberries. We make preserves out of them and are old in the ways of the hills. Remember the 'Foxfire' series of books? Well, they were created not far from here in Rabun County Ga., on the other side of the ancient Tugalo River. I live in the Sacred Hills of the Cherokee Indian tribe not far from their ancient capitol which is now under water (man made lake). I studied and raised honey bees for several years in the mid-1970's. I've studied all sorts of species of bees as well as other insects. I 'think' the queen actually flies herself to the new location within the "swarm." The seeping honey? The workers actually cool the hive by fanning their wings, a bunch of them work together to create "the flow." If this isn't done, the wax could melt on hot days!!! If they don't store enough honey during the summer (HARVEST TIME), they may starve to death before next crop the following year. Chances are, if you opened up the wall, you would find their dead bodies still there. They could have moved but I doubt it. They do have 'guard' bees; they are the worker bees and they are all the same size. The real big ones are "drones"; they are the males and I haven't observed them doing much of anything except SEXUALLY HARRASSING the females. for this valuable information. The dripping (not seeping, thank goodness) through a window casement has increased in flow on hot days, but seems to be slowing now. Also the moth size is diminishing. Hopefully we're coming to the end of this particular difficulty. Spiritseek, was there honey up in that attic? have developed bees this year. a couple of months ago I noticed that a chunk of mortar has fallen out from between the stones of which my Victorian terrace is built, and bees were flying in and out. I called the Council's pest control department who assured me that the bees wouldn't do any structural damage, although they did say that if the hive grew very big then honey could seep in through the plaster.....a notion that rather appealed to me! Apparently despite this lack of damage to the house many people do insist that the council come and eradicate the hive, but I'm growing fond of my little colony (for small it appears to be). Given that I live in the middle of a city there is a good range of local wildlife ranging grom a family of foxes, loads of rabbits around the neighbouring hospital grounds and a good variety of birds, which all come to feed in my garden. No one wished to venture up into the depth of the attic but I wouldn't be surprised it there had been bees, because several times there has been one flying around inside the house. I'm glad more people are allowing the migration of these bees to live within their homes because they have been so scarce.